Haha a pitcher is nothing baby I drink a pools worth (poor liver). Haha I want to see that one!! Of course I know it. Classic film - Shane Meadows one of my favourite directors. Haha it can indeed but as long as you don't let me mix beer I'm great drinking all night. How would I convince you? I know and you know its a classic but I know many people who stare blankly if you mention Shane Meadows.. Have you seen Somers Town yet? and whiskey all in one night usually. 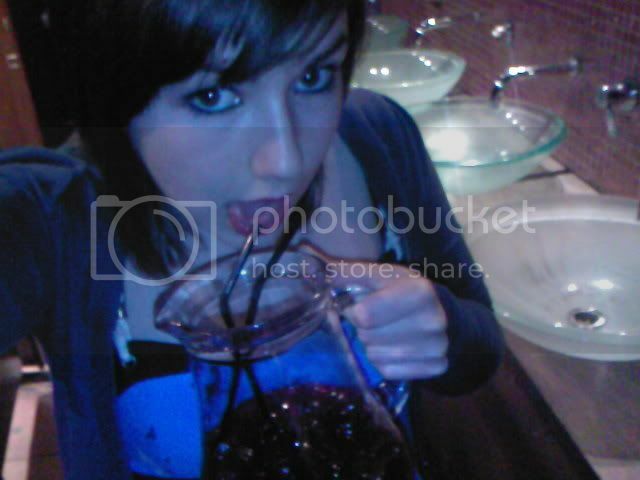 Hahaha yeah I'm the same.. Friday night I had Sambuca 2 kinds of beer cider a litre of WKD and 4 VKs, that wasn't fun. I haven't seen Dead Man's Shoes yet (scandal!) need to watch it..
Can I pm you later? Paddy Considine acts impeccably, and the realism in this is sublime, I can actually believe stuff like that happens in Derbyshire - to an extent, I mean I know of some people who I think are complete mimics of the characters in it. It was shot in Matlock - excellent place to go out Love it - Local legend! Yeah, I do it with the avatars and when they change them it surprises me! And you look like a painting. From the 70s. You have black/ dark brown hair, brown eyes, slim/thin figure and wears quite strange clothing sometimes, and you're caucasian.